Rozšiřující příručka pro fantasy hru na hrdiny Dungeons & Dragons. Naleznete v ní vše o démonech, nové mechanismy, zápletky pro příběhy, nestvůry a mnoho dalšího! Kniha má 160 barevných stran, pevnou vazbu, je psána anglicky. More than just a maelstrom of chaos and corruption, the Abyss is an exciting D&D adventure locale for paragon- and epic-level heroes to explore. Within its many layers lurk powerful demon lords and fiendish hordes eager to be unleashed upon unsuspecting worlds. 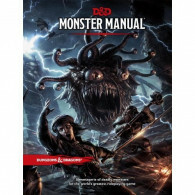 This tome brings demons into the world of D&D, updates classic demons to 4th Edition, provides statistics for various demon lords, and introduces dozens of new horrors from the abyssal depths. It gives Dungeon Masters ready-to-use encounters and mechanics to make demons exciting elements in their home campaigns. Produkt Dungeons and Dragons: Demonomicon zatím nikdo nehodnotil. Dungeons and Dragons: Demonomicon není skladem.